The landscape of news distribution has changed dramatically since the dawn of the Internet Age. These days, the “Twitterverse” is usually the first on the scene with breaking news – albeit allegations at best in most scenarios – with credited online news organizations following shortly after with more legitimatized versions of the story. With these younger news sources delivering stories at what, at times, feels faster than the speed of light, broadcast television has had to find ways to adapt and keep up in the race to deliver news. Television news broadcasting operates differently than that which is published on the vast online stratosphere. Needless to say, it requires a physical presence – journalists reporting from a newsroom or on the scene with a camera crew. Delivering a story isn’t always as simple as logging on and posting an article written from the comforts of one’s home. So when Chris Yates, an aviation analyst and regular talking head for stations like the BBC and CNN, was called on to correspond on breaking news stories, he’d often have to drive out to a station’s respective news center, or have a news truck sent out to him. That is, until he discovered BoinxTV. 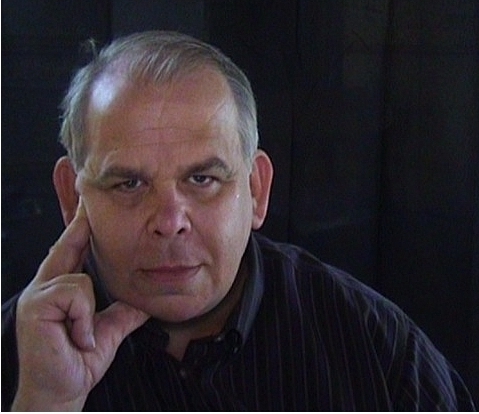 Chris has worked in the broadcast and print industries for over 30 years. He cut his journalistic teeth with a decade-long stint in BBC radio, before switching to print media with the globally renowned defense publisher Jane’s Information Group as an editor and company spokesperson across radio and television. At the same time, he successfully ran his own aviation security, safety and terrorism consultancy business on the side, which went fully independent in 2009. Chris has been across most of the major aviation-related stories for over a decade, including the Concorde disaster, 9/11, Air France 477, Underwear Bomber, Bin Laden death and many others. Although he knows his way around the radio or television studio like the back of his hand, Chris now has the luxury of broadcasting live from his own home office studio. Being available for a live television broadcast would often require Chris to travel to the nearest studio at the first hint of trouble in the past. While the nearest BBC and ITV studios (both of which have reciprocal arrangements to feed other global broadcasters) are a mere 18 miles away, others, like Sky News, could be up to a 40-mile journey from his home office. “Major news events that once consumed huge amounts of time are now responded to with a couple of mouse clicks, and at a fraction of the cost previously incurred in terms of personal travel. Not to mention studio booking fees and satellite uplink time incurred by others,” Chris says. Given the immediacy of radio and television news nowadays, the majority of mainstream broadcasters are increasingly turning to telecommute solutions such as Skype to get on-air talent live as quickly as possible. 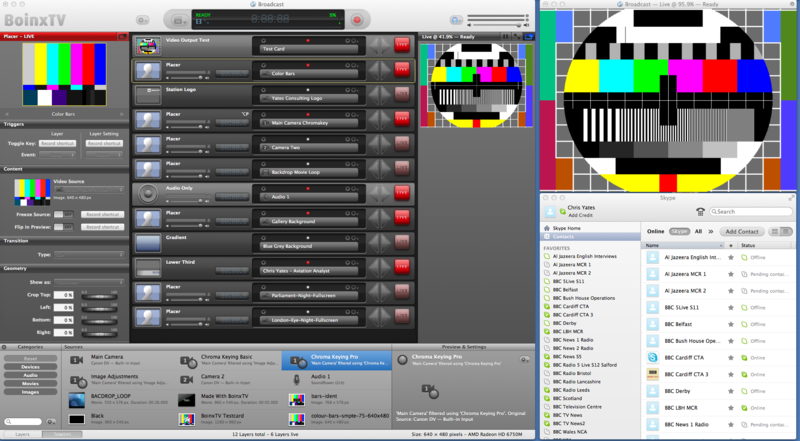 Chris says that early tests with Skype demonstrated particular issues, such as out-of-sync audio and video, that could have a big impact on an effective performance in the live-to-air environment. 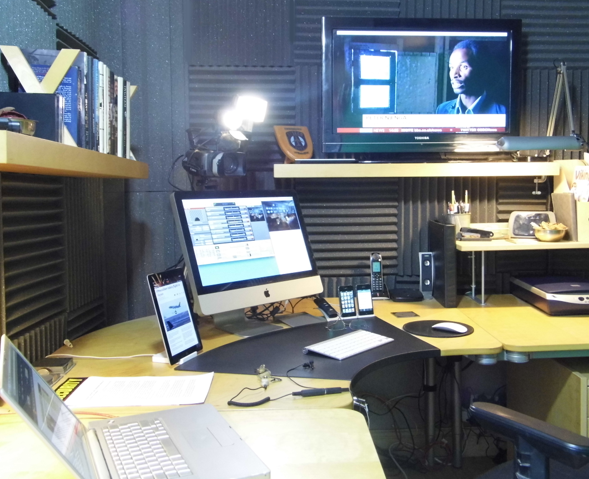 In his office studio setup, Chris runs a primary quad core iMac workstation and dual core MacBook Pro, along with an iPad and a couple of iPhones. A Canon 3CCD camera, full digital audio, and color-corrected lighting enables live television appearances. Two 32-inch Toshiba monitors allow him to actively view live off-air scenes from the field, enabling him to appropriately react to an evolving story in real time as he broadcasts live. “Outbound feeds are achieved predominantly via Skype and delivered by standard or high-bandwidth broadband links. I typically feed out in standard definition, leaving broadcasters free to upscale to suit their own requirement at the other end,” Chris concludes. Chris recently took to the air and clocked up 18 hours of solid television and radio broadcasting over a single day across CNN, BBC World, Al Jazeera, Sky News and multiple other domestic and international channels, aided in large part by BoinxTV software. Now THAT’S something to Tweet loudly about.